"This is the type of smoothie that you can throw together quickly for a meal or snack." 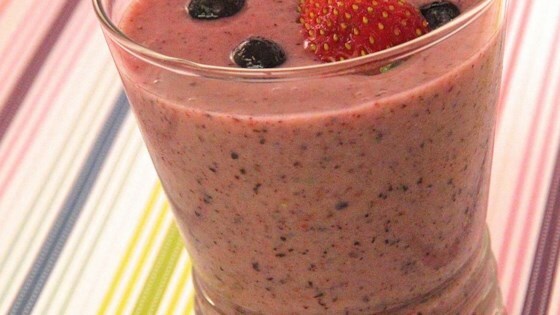 Combine strawberries, blueberries, bananas, orange juice, yogurt, and soy milk powder in a blender. Blend until smooth, then pour into glasses and serve. This healthy juice features kale, cucumber, apples, ginger, and lemon. The bitterness of the plain yogurt overpowered the smoothie. Maybe I'll add a couple tablespoons of Splenda next time, or use vanilla yogurt. Great for breakfast! I used fat free vanilla yogurt and I don't have soy milk powder so I just used skim milk in it's place. All it needed was a bit of crushed ice and a straw. i tryed putting 2% milk instead of the powder and it was even better!!!! Good- a little frothy for my taste...but maybe there's a way around that. It's certainly worth experimenting with!